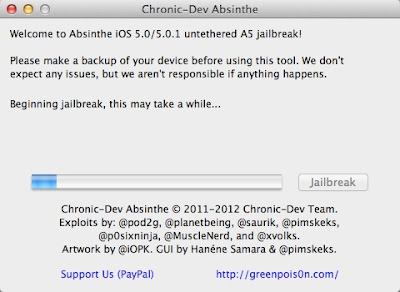 So you've been at the beginning of the Absinthe jailbreak (see post here regarding HOW-TO Untethered jailbreak iOS 5 on iPhone 4S/iPad 2) for a while and progress bar hasn't moved in the last 20-30 mins. Well, here's an easy fix. Close Absinthe and slide to unlock your phone and go through all "setup options" until you get to the home screen of your iPhone (do not backup yet, just continue without backing up for now). Go to Settings and "Erase All Content and Settings". Now close iTunes on your computer when the device reboots and do not backup yet. Now slide to unlock your phone again and go through all the options until you get "Activating Phone" screen comes up. Wait for your phone to active (may take a couple minutes), then STOP. Don't click anything more on your iOS device. NOTE: Because Absinthe creates a backup and restores it onto your device as part of the way it gets files on the device, we recommend the device is mostly empty when you start the process. To do this, CREATE A BACKUP IN ITUNES FIRST (connect to iTunes and sync). If you're using iCloud to backup, go to Settings > iCloud > Storage and Backup > Backup Now. ONLY ONCE YOU'VE BACKED UP, on your device go to Settings -> General -> Reset -> Erase All Content and Settings. MAKE SURE YOU'VE BACKED UP YOUR CONTENT. You do not have to Erase All Content and Settings if you don't want to, but the jailbreak could take up to 20-30 minutes (or seems to be almost forever!) to complete if you don't, depending on what's on your device. Now open Absinthe and click "Jailbreak". It shouldn't take more then a couple minutes to jailbreak. Once it's complete and it tells you to "slide to unlock your device", continue through all the remaining setup options till you get your home screen once again. NOTE: The Set Up iPhone (or iPad) GUI you see when you restore an iDevice will now appear. If you backed up with iCloud at the beginning of this tutorial, please choose Restore from iCloud Backup in the Set Up iPhone GUI, and restore from the backup you took at the beginning of this guide. The iDevice will then restore from backup, reboot, and you're good to go.